Globalspace, an Indian software and solutions firm, isn't a well-known name in the hardware market. 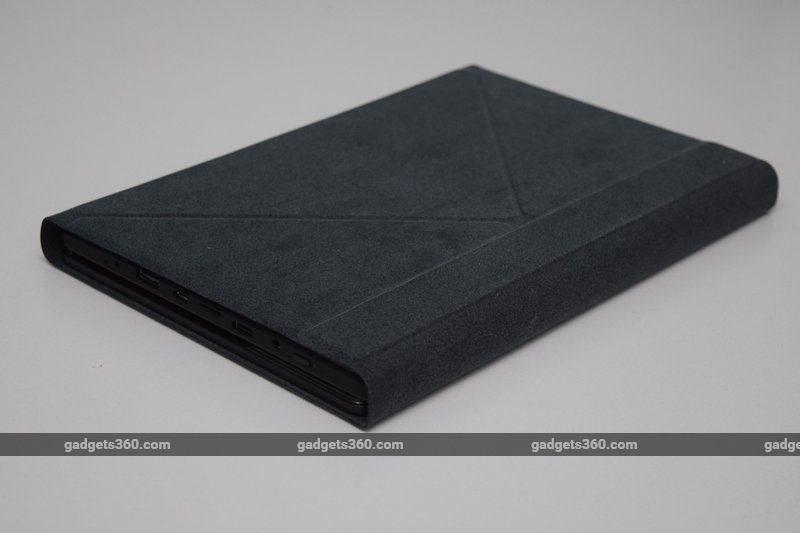 The company has dabbled in the low-cost Android space before, and has now come up with a device that it claims is the first of its kind, a "3-in-1" tablet. Obviously a play on Intel's 2-in-1 marketing strategy, this device is claimed to work like a tablet, laptop or desktop, with the appropriate accessories connected. 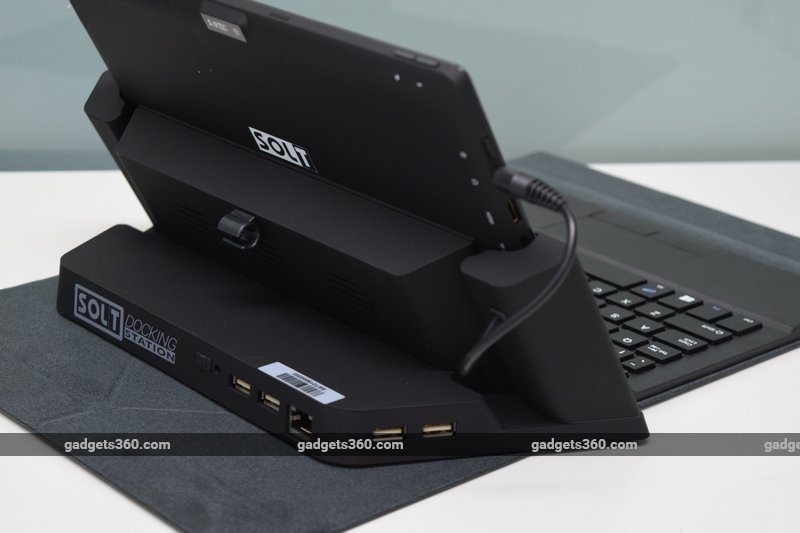 The GlobalSpace Technologies Solt consists of three distinct units: the tablet itself, a wraparound keyboard case, and a desktop dock. 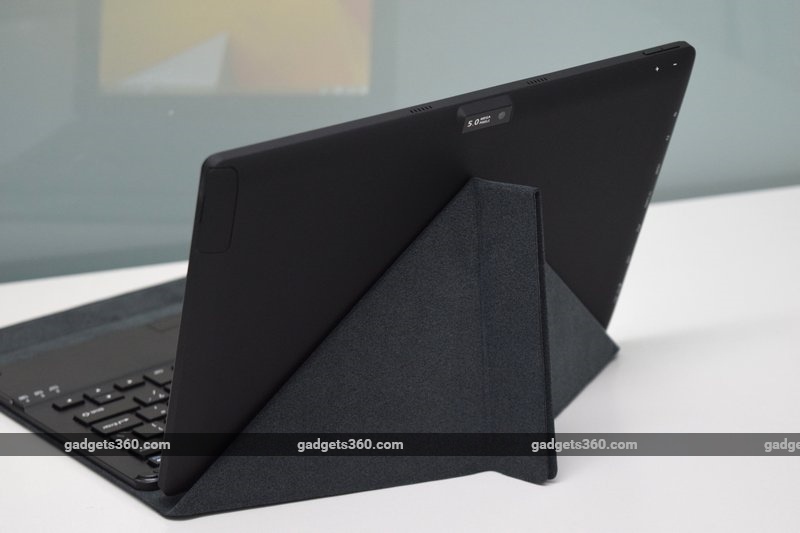 We've seen a number of companies use the keyboard case approach to position tablets as cheap laptops, and the resulting products, including the Micromax Laptab LT666 (Review), Swipe Ultimate Tab 3G (Review), Notion Ink Cain (Review) and Croma 1177(Review), have all offered much the same in terms of hardware, experience, and value for money. Globalspace is going beyond that, with a few extra tricks. We're eager to try this "3-in-1" concept. First, the tablet. 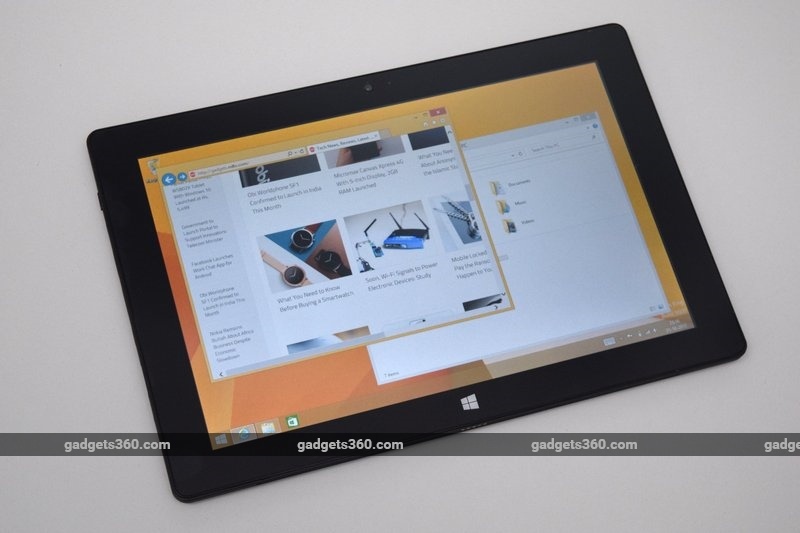 It looks pretty much like every other low-cost 10-inch Windows tablet we've reviewed so far. The front is mostly unremarkable, with thick black borders, a capacitive Start button below the screen and a webcam above it. Our review unit came with a factory-fitted matte film for scratch protection. The rear has a matte finish as well. The primary camera is centered near the top, assuming a landscape orientation, and there are a few logos and some regulatory text which look like they might rub off with minimal effort. A flap in the upper right corner of the rear opens to reveal a slot for an optional 3G module. There are contacts on the bottom for the keyboard dock and two small speaker grilles on the top. All the ports and controls are clustered around the left - there are two volume buttons on the left end of the top, while the side itself is host to the power button and LED, a 3.5mm audio jack, a Mini-HDMI port, a microSD card slot, one Micro-USB port (which works as a USB host with the included OTG adapter), a full-sized USB 3.0 port, and the DC power inlet. There's also a little mic hole right at the bottom. The keyboard case is also now pretty standard. The keyboard itself is a solid plastic unit, attached to a bit of stiff fabric that can fold around the tablet to protect it. You have to pinch the cover into a stand, and it will stay in place with magnets. It's a very clever idea, but it doesn't allow you to adjust the angle of the screen, and it simply doesn't let you use the device on your lap. The keyboard is a bit cramped, especially around the arrow block, but that seems unavoidable anywhere these days. There are Fn-key combinations for common tasks such as media playback, and there's even a virtual numpad. However, PrintScrn has simply been left off and there don't even seem to be any combos for Insert, Home, End, Page Up or Page Down. While not used by everyone, these will definitely be missed by those who intend to do any office work. The most intriguing part of the package is the dock. 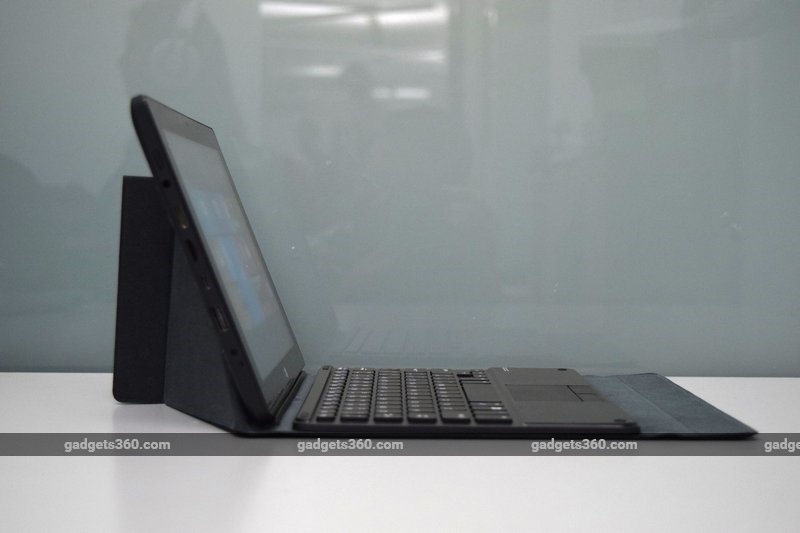 It's designed to hold the tablet upright whether or not the keyboard case is still attached. If that is the case, the cloth will have to extend flat out the back. The two "arms" are slightly flexible and have a felt-like material on the insides to hold the tablet. However the docking mechanism itself is pretty crude - there are male USB and power connectors lined up with the ones on the tablet's side, and you have to slide it into them. You can't adjust the angle of the tablet when it's in the dock. The Micro-USB port and microSD slot are also blocked, but it isn't a huge deal since the tradeoff is you get four full-sized USB ports and an Ethernet port on the rear of the dock. There are two speakers on the rear, and you'll have to physically plug a 3.5mm lead into the tablet's audio jack to use them. There's even a little clip to hold the lead when you aren't using it. Finally, there's the dock's best feature: a 2.5mm drive bay. GlobalSpace's website states that a 500GB hard drive is optional, but we couldn't find any evidence of the company selling the Solt dock with a drive preinstalled - it looks like that's up to the buyer. The dock has its own DC power supply so you can leave it plugged in. 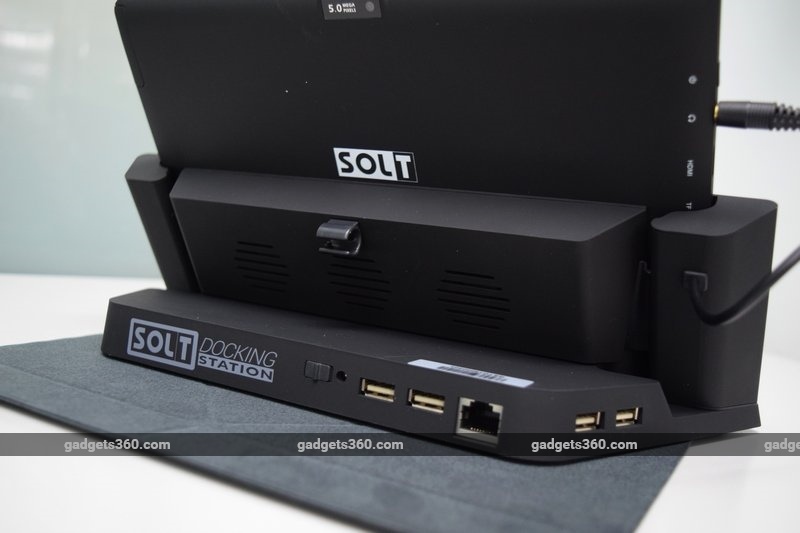 Honestly, even with the whole 3-in-1 package, there's nothing desktop-like about the Solt other than the fact that you'd have to sit at a desk to use it. You do get a little more power and flexibility, but at the end of the day this is still a tablet in a stand. 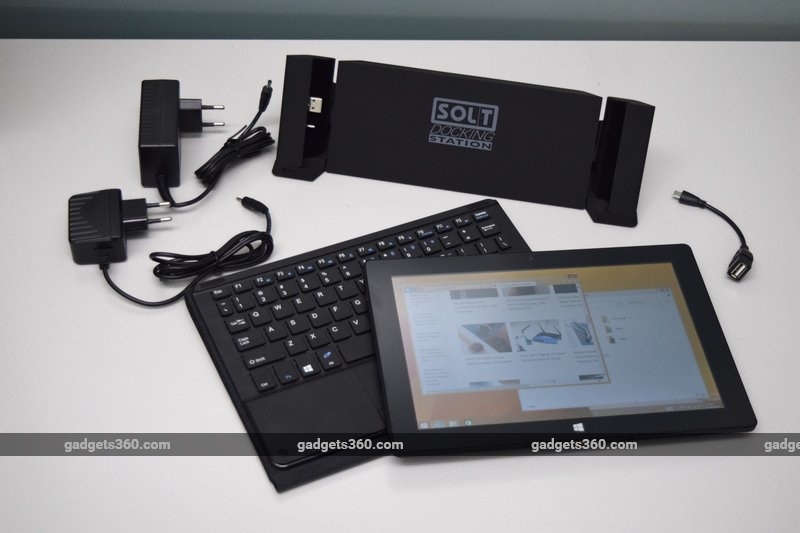 All the components that make the Solt run are inside the tablet. At its heart is an Intel Atom Z3735 processor, the same as all the other tablets of this kind we've seen so far as well as some other interesting devices such as the Intel Compute Stick. This model has four low-power cores based on the Bay Trail architecture which run at 1.33GHz - the official spec says 1.8GHz, but this is only the peak burst speed. There's 2GB of RAM and 64GB of internal storage. MicroSD cards of up to 128GB are supported, and you always have the USB ports for external devices, plus of course the dock. The 10.1-inch screen has a resolution of 1280x800 and 10-point touch recognition. There's Wi-Fi b/g/n and Bluetooth 4.0, but the spec sheet also describes 3G capabilities, for which you'll need to buy a separate Huawei Ultrastick module. The rear camera has a 5-megapixel sensor and the one in front is just 2 megapixels, and that too fixed-focus. The battery has a capacity of 7900mAh. One of the most interesting things that GlobalSpace provides though is a one-year insurance policy. A paper in the box details the process you need to go through to claim coverage, which involves emailing the details of your purchase to a representative within 30 days. The tablet comes running Windows 8.1 32-bit which you can upgrade to Windows 10 for free. GlobalSpace offers an app for Android and Windows called MySOLT which includes an anti-theft remote locking feature and lets you chat with support staff. 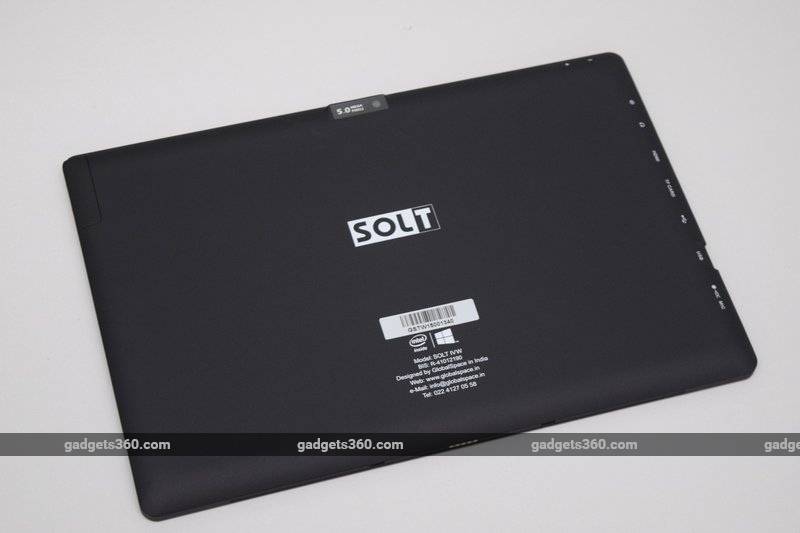 As expected, the Solt tablet delivers entry-level performance. Ergonomically, it isn't the easiest device to use, especially in its desktop avatar. The pre-attached screen protector makes everything look slightly speckled and causes a bit of friction when dragging a finger across the screen. HD videos played smoothly, but it wasn't much pleasure watching them on this screen. Note that the device doesn't behave like a laptop or convertible when connected to the keyboard case. It won't automatically go to standby when you flip it closed - the screen won't even go off. Conversely, Windows doesn't recognise when the case is disconnected, so you have to trigger the on-screen keyboard manually when needed. The keyboard has a crisp action and is okay for finger-picking, but not really suited for heavy typing. The trackpad is quite imprecise and is also a bit too small for comfortable use. The tablet's own speakers are loud, but sound isn't all that detailed or clear. We were surprised by how rich the dock's speakers sounded, but the downside here was that low frequencies caused distortion and made the entire unit vibrate on our desk. 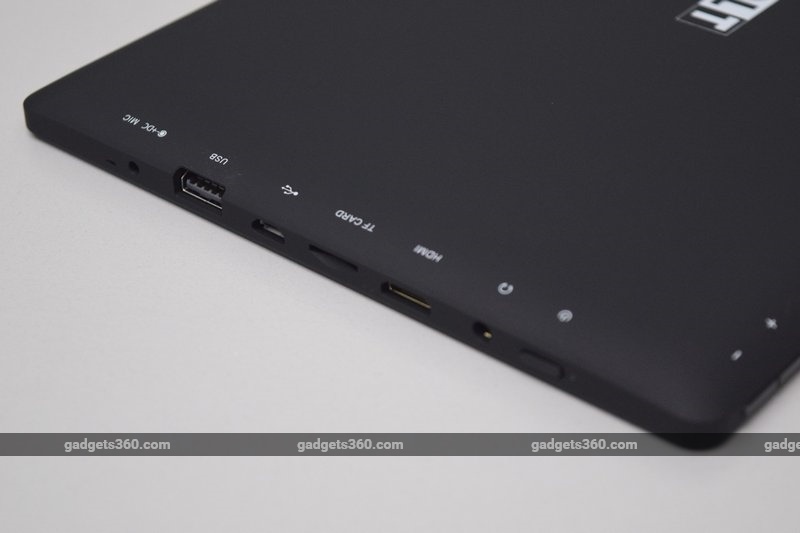 The dock connects to the tablet via a USB 2.0 connector, despite the tablet having a USB 3.0 port and the fact that bandwidth has to be split between four downstream USB 2.0 ports, the hard drive and the 10/100 Ethernet connection. This seems to us like an odd decision. It's also not the most reliable - we saw repeated "USB device not recognised" warnings in Windows, and we sometimes needed to adjust the tablet's position. At one point, there was a warning that the USB hub was not able to deliver enough power to the ordinary hard drive that we had plugged in. 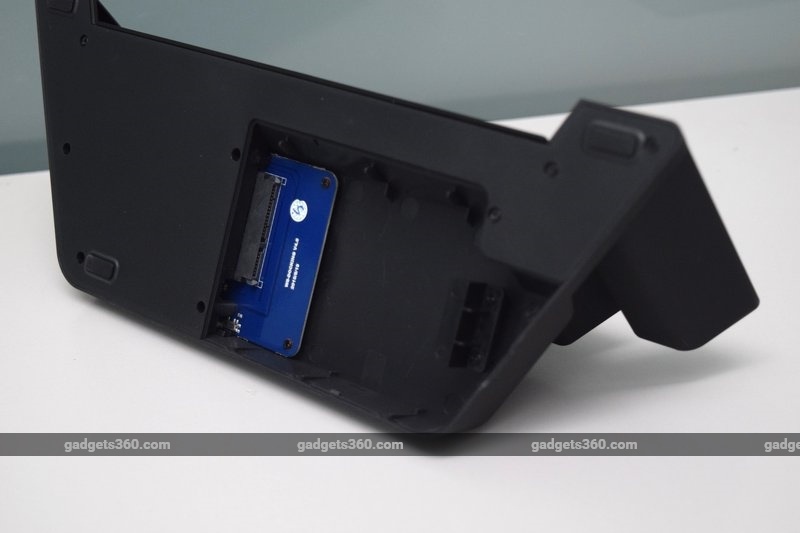 We tried installing a standard 2.5-inch SSD into the dock, but it was just not recognised. We also found that the flap concealing the drive bay was difficult to open, and the plastic holding bracket was flimsy. You have to be careful when screwing it in, because you're likely to strip the treads off the plastic. All in all, we found the desktop part of the "3-in-1" concept a bit of a letdown. The regular 2-in-1 tablet and keyboard combination, however, is just as good as any other we've seen. If you need an extremely affordable portable Windows computer with a touchscreen, this is a solid option. Performance in benchmarks was also on par with other Atom Z3735-based devices. CPU, RAM and storage scores as measured by SiSoft SANDRA were pretty much identical to the aforenamed equivalent devices from Micromax, Croma, Notion Ink, and Swipe. 3DMark refused to run and PCMark 8 gave us 1161 points in the Home (Accelerated) test and 1968 in the Work test. The only anomaly was POVRay, which took twice as long as the others to trace its internal benchmark render. The Solt lasted 3 hours, 46 minutes in Battery Eater Pro. We were able to stretch that to about five hours with basic PC usage with Wi-Fi on and the brightness set at 50 percent. We did feel the rear left of the tablet get uncomfortably warm when tests were running. GlobalSpace's marketing department describes the Solt as a tablet, laptop and desktop, but of course you'd need very generous definitions of the latter two product categories in order for that to be true. It is still basically a tablet with two accessories which, while innovative, cannot elevate it to a higher purpose. As flexible as the Solt is, it's still suited only for basic tasks such as Web surfing, communications, casual games and entertainment. 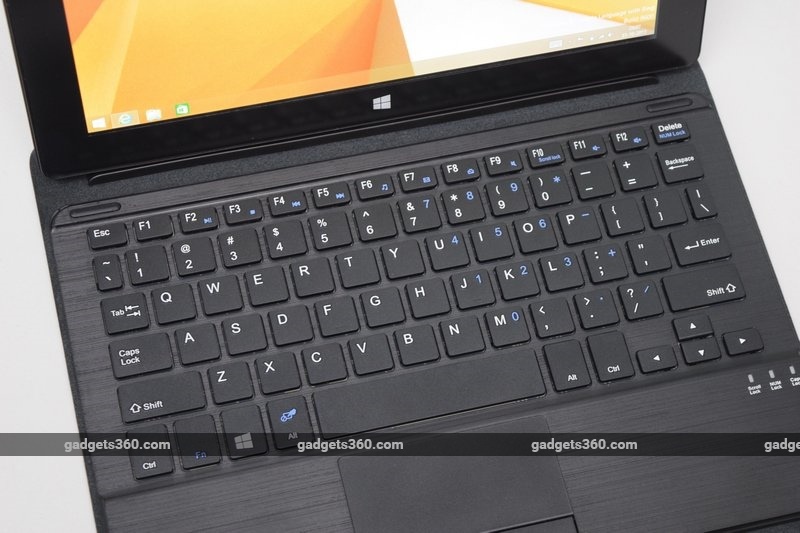 If you're on a tight budget and don't particularly care for a touch-capable tablet device, there are low-cost laptops that would be better suited for getting work done on. Full credit to the company for its imagination, though, and for keeping costs low. It's always good to have options, but considering that there's a choice between the full 3-in-1 package priced at Rs. 19,450 and its 2-in-1 configuration (minus the desktop dock) for Rs. 14,900, we would save some money and take the latter.